Believing in service to my country, in 1970, at the age of 18 years, I joined the Army. I was sent to Fort Lewis, WA, for Basic Training, and then to Fort Sill, OK, for Advanced Individual Training (AIT). I served with the 1st Cavalry Airmobile Division, 1/21 Artillery (1st Battalion 21st Artillery 105mm), and saw action in Central Vietnam in the last years of the Vietnam conflict. As the airmobile division, we were transported by helicopters, along with our guns and ammunition, to new locations every few weeks, as we followed and supported the Infantry. We never knew where we would be at a given time, and at one point, had landed in Cambodia. The 1st Cavalry Division is said to have suffered a great number of casualties during the Vietnam war. I count many friends among them. 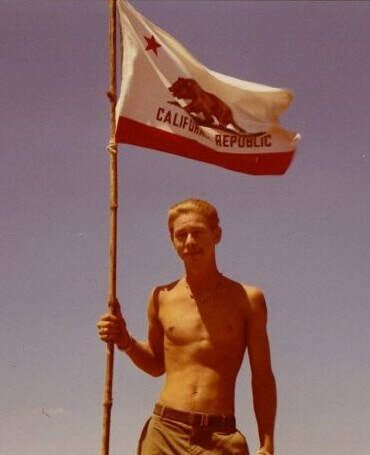 The photograph of me holding the California State flag was taken in the mountains of Vietnam. It is a proclamation of my origin and pride in my home State. I grew up in Lakewood, but after my time in the Army, my wife, Ginnie, and I settled in Long Beach--but not for long. In 1975, we purchased a house in Lakewood, the same one we still call home. We raised our two boys here, and today, one is an Anesthesiologist and the other is a Logistics Broker. Ginnie and I will shortly be celebrating our 47th wedding anniversary.